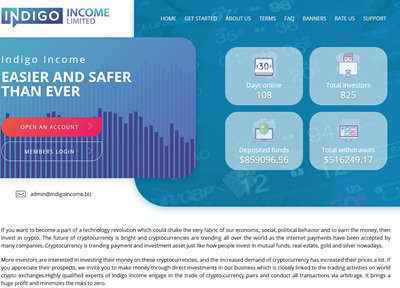 INDIGO INCOME - ведущая онлайн-инвестиционная платформа в прибыльной сфере рынка цифровых криптовалют, которая стремится предоставить вам высококачественный сервис и генерировать достаточное вознаграждение для всех участников. Торговля криптовалютой становится очень прибыльным бизнесом. Этот новый, чрезвычайно изменчивый класс активов обещает доходность, превышающую все, что на других рынках в настоящее время может. Криптовалюта является одной из быстрорастущих отраслей, рыночная капитализация которых достигает рекордного уровня в 100 миллиардов долларов. 02.03.19 05:22;Account;Receive;Received Payment 0.5 USD from account U17778890 to account U1294000. Batch: 248940639. Memo: API Payment. Withdraw to allhyips from Indigo Income - Easier and safer than ever. 03.03.19 05:24;Account;Receive;Received Payment 4.5 USD from account U17778890 to account U1294000. Batch: 249073075. Memo: API Payment. Withdraw to allhyips from Indigo Income - Easier and safer than ever. Indigo Income +9.5 Received Payment 9.5 USD from account U17778890. Memo: API Payment. Withdraw to FairMonitor from Indigo Income - Easier and safer than ever. 04.03.19 05:33;Account;Receive;Received Payment 4.5 USD from account U17778890 to account U1294000. Batch: 249201656. Memo: API Payment. Withdraw to allhyips from Indigo Income - Easier and safer than ever. Indigo Income +12.5 Received Payment 12.5 USD from account U17778890. Memo: API Payment. Withdraw to FairMonitor from Indigo Income - Easier and safer than ever. 06.03.19 04:00;Account;Receive;Received Payment 5.5 USD from account U17778890 to account U1294000. Batch: 249503786. Memo: API Payment. Withdraw to allhyips from Indigo Income - Easier and safer than ever. 05.03.19 04:28;Account;Receive;Received Payment 4.5 USD from account U17778890 to account U1294000. Batch: 249347925. Memo: API Payment. Withdraw to allhyips from Indigo Income - Easier and safer than ever. 05.03.19 04:28;Account;Receive;Received Payment 1.5 USD from account U17778890 to account U1294000. Batch: 249347885. Memo: API Payment. Withdraw to allhyips from Indigo Income - Easier and safer than ever. 07.03.19 09:36;Account;Receive;Received Payment 4.5 USD from account U17778890 to account U1294000. Batch: 249690381. Memo: API Payment. Withdraw to allhyips from Indigo Income - Easier and safer than ever. 07.03.19 03:59;Account;Receive;Received Payment 1.26 USD from account U17778890 to account U1294000. Batch: 249655789. Memo: API Payment. Withdraw to allhyips from Integra Trade Limited. Indigo Income +19.5 Received Payment 19.5 USD from account U17778890. Memo: API Payment. Withdraw to FairMonitor from Indigo Income - Easier and safer than ever. 08.03.19 17:53;Account;Receive;Received Payment 1.00 USD from account U17778890 to account U1294000. Batch: 249901885. Memo: API Payment. Withdraw to allhyips from Indigo Income - Easier and safer than ever. 08.03.19 05:30;Account;Receive;Received Payment 3.35 USD from account U17778890 to account U1294000. Batch: 249806603. Memo: API Payment. Withdraw to allhyips from Indigo Income - Easier and safer than ever. 08.03.19 05:30;Account;Receive;Received Payment 4.5 USD from account U17778890 to account U1294000. Batch: 249806575. Memo: API Payment. Withdraw to allhyips from Indigo Income - Easier and safer than ever. Indigo Income +10.00 Received Payment 10.00 USD from account U17778890. Memo: API Payment. Withdraw to FairMonitor from Indigo Income - Easier and safer than ever. 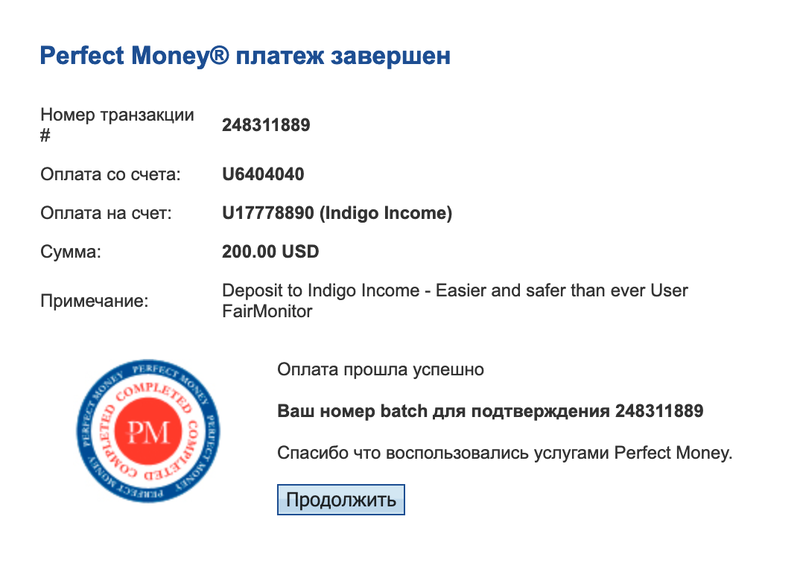 Indigo Income +2.00 Received Payment 2.00 USD from account U17778890. Memo: API Payment. Withdraw to FairMonitor from Indigo Income - Easier and safer than ever. 10.03.19 09:38;Account;Receive;Received Payment 0.26 USD from account U17778890 to account U1294000. Batch: 250095792. Memo: API Payment. Withdraw to allhyips from Integra Trade Limited. 09.03.19 17:41;Account;Receive;Received Payment 4.5 USD from account U17778890 to account U1294000. Batch: 250027985. Memo: API Payment. Withdraw to allhyips from Indigo Income - Easier and safer than ever. 11.03.19 04:29;Account;Receive;Received Payment 4.5 USD from account U17778890 to account U1294000. Batch: 250195673. Memo: API Payment. Withdraw to allhyips from Indigo Income - Easier and safer than ever. 12.03.19 11:06;Account;Receive;Received Payment 4.5 USD from account U17778890 to account U1294000. Batch: 250411394. Memo: API Payment. Withdraw to allhyips from Indigo Income - Easier and safer than ever. Indigo Income +5.5 Received Payment 5.5 USD from account U17778890. Memo: API Payment. Withdraw to FairMonitor from Indigo Income - Easier and safer than ever. Indigo Income +13.5 Received Payment 13.5 USD from account U17778890. Memo: API Payment. Withdraw to FairMonitor from Indigo Income - Easier and safer than ever. 13.03.19 13:20;Account;Receive;Received Payment 4.5 USD from account U17778890 to account U1294000. Batch: 250601386. Memo: API Payment. Withdraw to allhyips from Indigo Income - Easier and safer than ever.